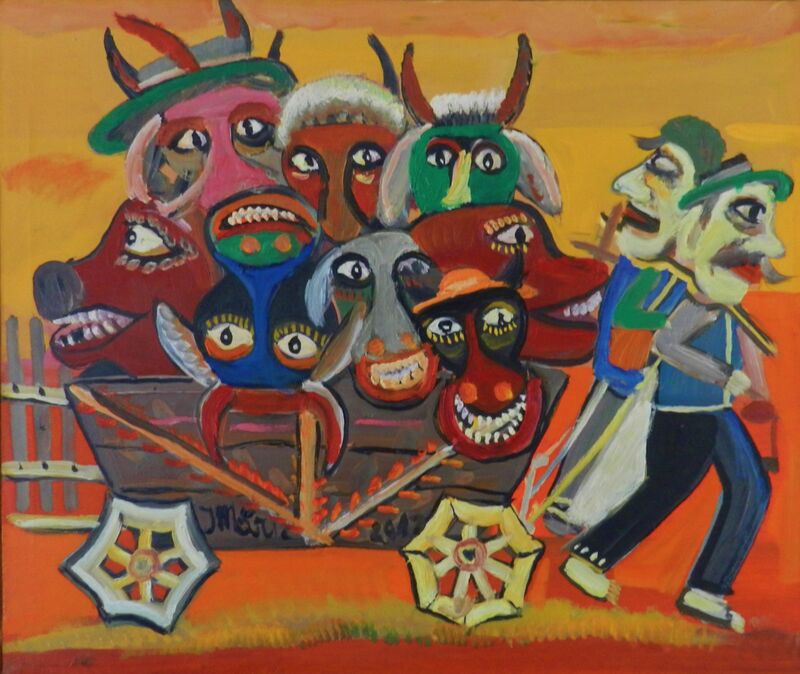 I first began collecting folk art in the late 1970s when I lived in the Caribbean, where I found striking cultural similarities between the local foods and customs there and those of the Lowcountry where I had spent my childhood. 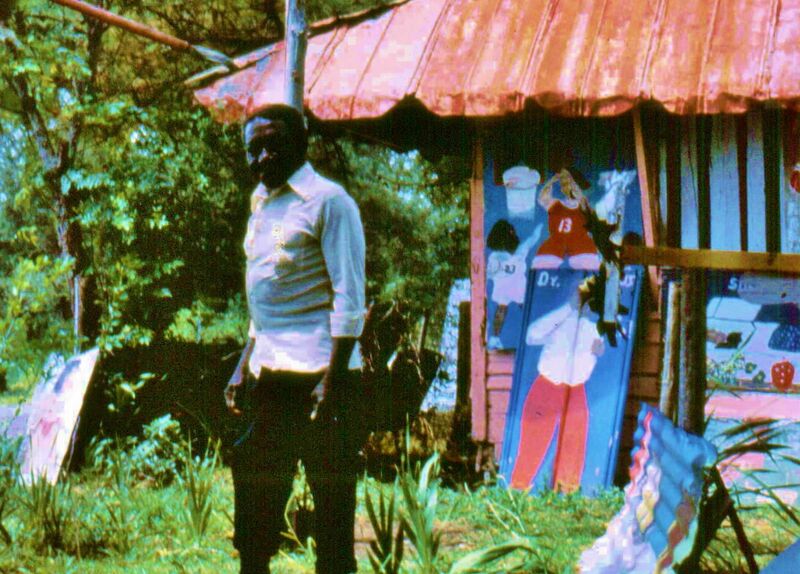 Upon my return, I interviewed Sam Doyle (left), the renowned outsider artist on St. Helena Island, South Carolina, whose paintings often depicted scenes and characters from the local version of “juju” practiced by the local “witch doctor,” Dr. Buzzard. After several more years abroad, I returned to the Lowcountry, where I found some local primitive artists whose work I collected, including the late PeeDee master, Henry Stone (right). I had begun researching the culinary history of the Lowcountry in 1984, and the further I delved into the cuisine, the more similarities I found between not only the foods, but the history, folklore, and customs of the coastal plain and the islands I had visited in the Caribbean and the West African nations whence had come the enslaved whose descendants preserved their cultural heritage. I opened my culinary bookstore in Charleston just as Jordan Meinster and John Burgess opened their West Indies Gallery, where they exhibited the works of many Caribbean artists. All of the paintings in this exhibition were either purchased from the gallery in the late 1980s and early 1990s or they were gifts from the painters and gallerists to Anne and Jim Olsen. The two couples later moved to San Miguel de Allende, Mexico. When Jim died, we inherited his collection. 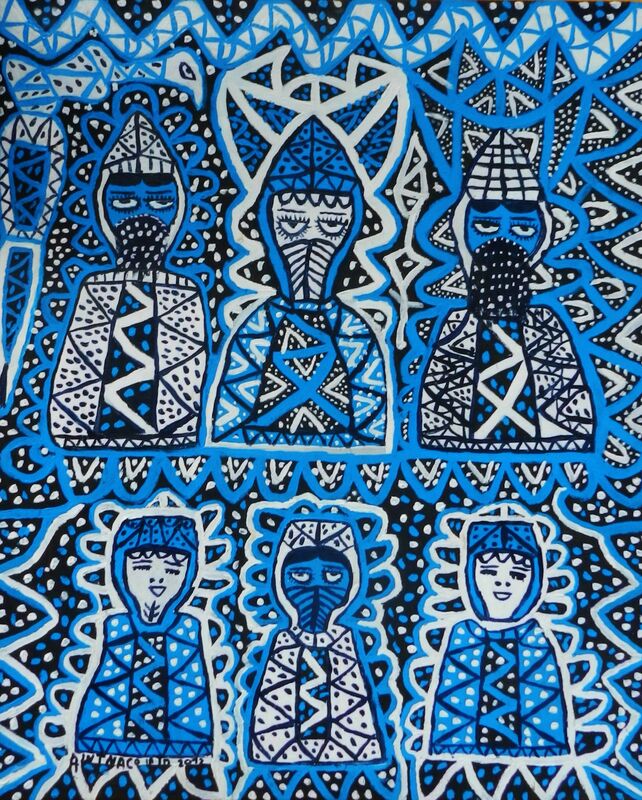 Wherever I have lived and traveled, I have sought outsider artists, such as Amina Costo in Morocco and Ioan Maric in Romania (above). After living in the Caribbean, France, Italy, Bulgaria, and China, I am preparing to move overseas again and, as such, am downsizing. I am offering the following art for sale. 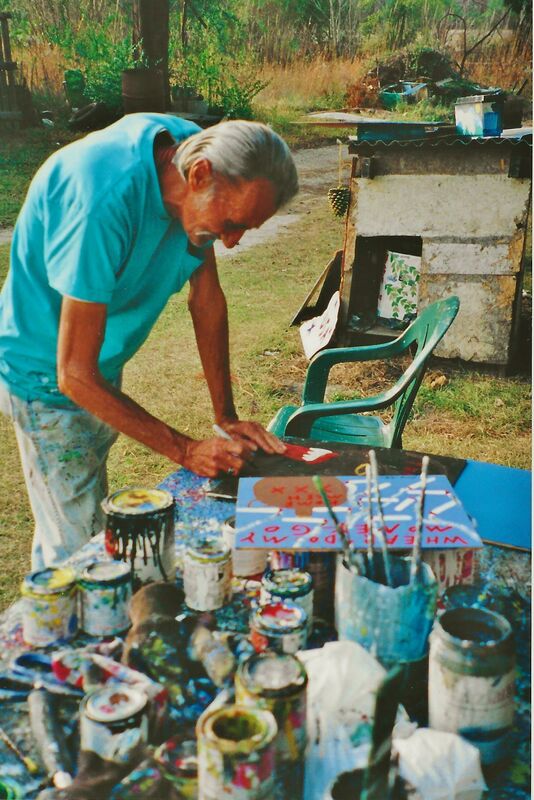 Jordan Meinster (American, 1935-2013) lived and painted in his home town of Philadelphia; in Puerto Rico, where he taught art; in Spain, and in Mexico. 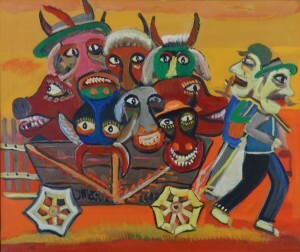 Widely exhibited, he was also a dealer of Caribbean art and owned Gallery West Indies in Charleston in the 1980s and early 90s. 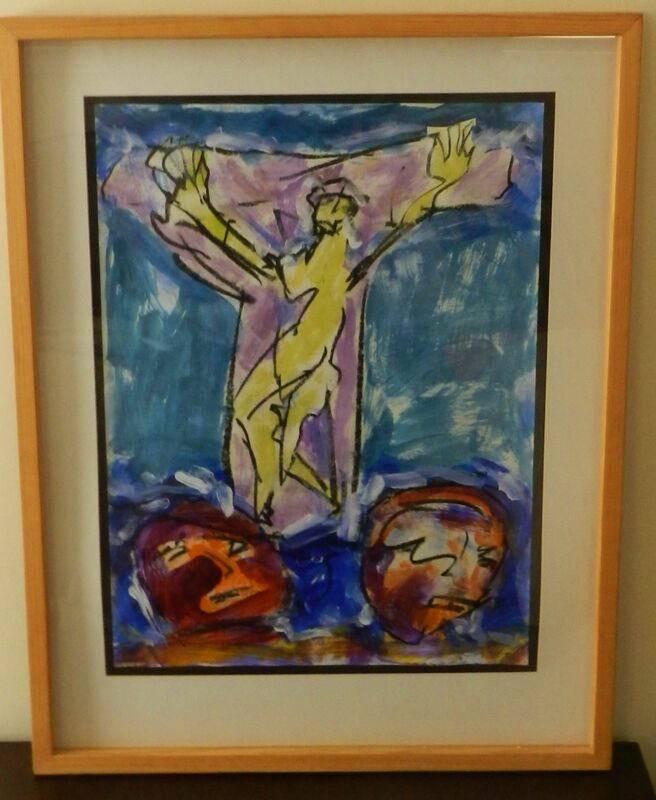 Meinster, Crucifixion, mixed media on paper, mounted under glass, 18”x24”, framed, 25”x 32” Signed lower right. 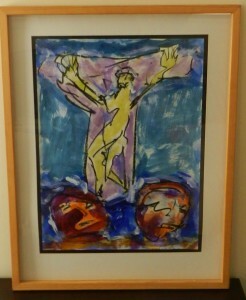 Painted when he lived in Mexico, where he was heavily influenced by the Catholic imagery of the region..
Meinster, Crucifixion, pencil on paper, mounted under glass, 17”x 24”, framed, 25”x 32” From his Mexican period. Signed upper left. Meinster, Mixed media on paper, mounted under glass. 11”x 13-1/2”, framed, 18” x 21”. Meinster, ”Los Hermanos,” 1996, mixed media on paper, mounted under glass, 8-1/2”x 12”, framed, 15-1/2”x 19-1/2”, Exhibition caption and bio on reverse. Meinster. 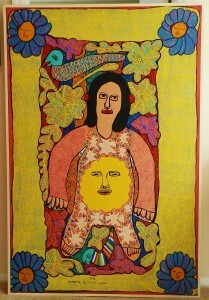 Signed on back with personal note, ”Para Anna, una de las Bacanales,un Esbozo, Con afecto, Jordan” San Miguel de Allende, 2008, oil on paper, 9”x 11-1/2”, framed, no glass, 16”x 20”. 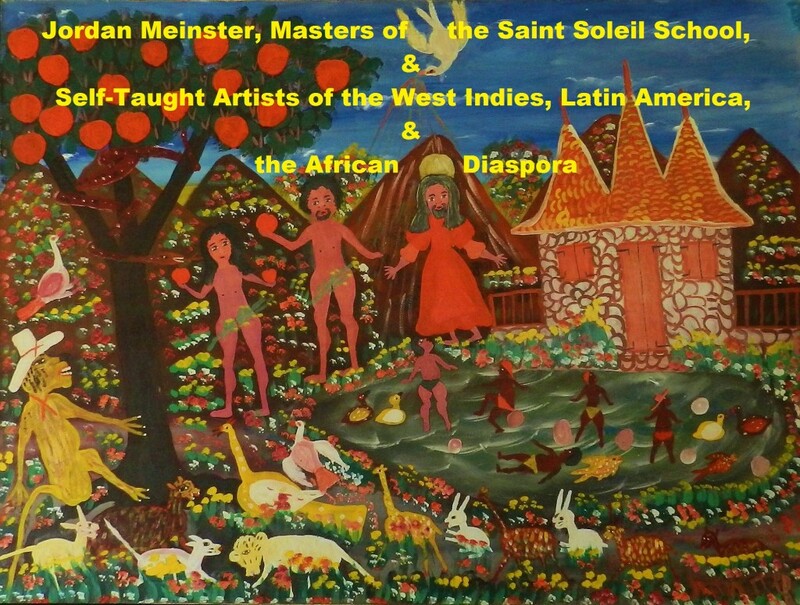 Founded in 1973 by Maud Robard and Jean-Claude Garoute (known as “Tiga”) in the hillside village of Pétion-Ville above Port-au-Prince, the Saint Soleil School of painters began as a rural arts community called Soisson-la-Montagne. Determined to foster a modern art over the naïve, the school taught and encouraged an academic study of painting. 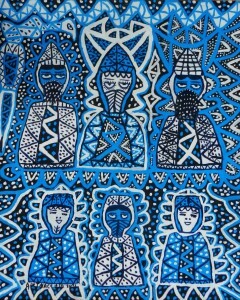 The painters, however, drew most of their inspiration from vaudou, representing voodoo gods, or loas, as abstract human forms, reflecting both native Taino, African, and Christian beliefs. A sense of joy is evident in the colorful paintings. Of the original ten painters, only Denis Smith and Levoy Exil survive. The name was coined by the French writer André Malraux, who proclaimed, “The community of Saint-Soleil is liberty proclaiming itself. It is one of the most startling experiences of our century: It is magic through painting.'' The precocious Jean-Michel Basquiat is considered by many to be a part of the Haitian art diaspora. The Saint Soleil group disbanded after only a few years but five of the artists, Prospère, Levoy Exil, Denis Smith, Dieuseul Paul, and Louisianne Saint Fleurant reorganized into the group "Cinq Soleils" in 1986. 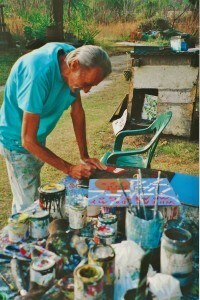 Prospère Pierre-Louis, 1947-1997, original member of Saint Soleil. Born on October 12, 1947, in Bainet, near Jacmel, Haiti. Though he had no formal training, he taught himself to play string instruments, and, as a child, assisted his father, a houngan, or voodoo priest, in preparing Haitian Vodu ceremonies. (Voodoo, Vaudou, Vodu, JuJu, etc, are various spellings of the creole religion practiced throughout the African diaspora.) At the age of 16 he moved to Port-au-Prince, the capital. Eventually he got a job as a waiter at the home of Maud Robard, who with Tiga began the Saint Soleil peasant commune, which Prospère joined. The organization sought to give academic training to poor artists including singers, dancers, craftsmen, and painters. Moving to Soisson-la-Montagne with the community, he became the most prominent painter in the group. Admired greatly by André Malraux, his work was exhibited not only in Haiti, but in Israel, France, Washington DC, and Germany. His sudden death from an asthma attack was widely mourned. Pierre-Louis. Painted in 1991, this huge (40”x 60”) oil on canvas is framed in simple white wood, ½”wide and 1-3/4”deep. Signed, lower middle..